Madonna and Child–As abstract as I get! 5″x7″ cherry wood block print on Somerset paper with Daniel Smith black ink. It’s fun to play around with new ways of doing things. Did you know that you can use dish soap to transfer an drawing onto a block? I read about this technique in an old book on printmaking. I decided to try it, and after some wrong turns I got it to work. I painted the block white with some old house paint I had hanging around, and after the paint was dry I coated the block with a fairly thick layer of dish soap and transferred my drawing by putting the drawing face down onto the soaped up block and rubbing it with the back of a spoon. The transfer wasn’t perfect, but it was good enough. The trick seems to be and having the block white, using the right amount of soap, and drawing with at least a number 2 pencil. 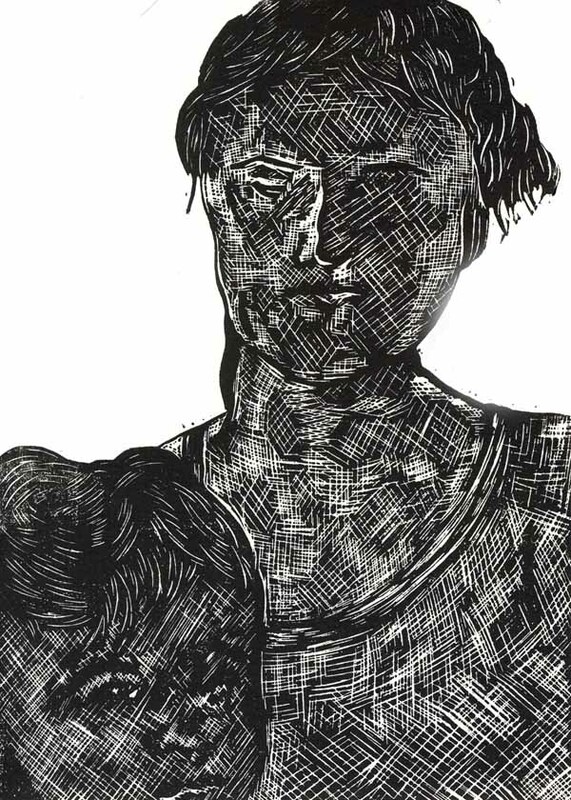 I tried to transfer an image onto grey linoleum but there wasn’t enough contrast to be able to see the image good enough to be able to carve it. I barely scratched the surface with my one millimeter V gouge when hatching and crosshatching because I am trying to learn to carve like an old man and let the tool do the work instead of trying to muscle my way through the wood. And while I need to carve like an old man, I still need to be able to play around like a kid.